Kickstarter campaign for the new album going now! I am beyond thrilled to be making a new record with Zachariah Hickman and Sam Kassirer of Josh Ritter's Royal City Band! We'll be working at The Great North Sound Society in my home state of Maine and I am hard at work Kickstarting this project into the world! Check out the campaign to see why this album is so meaningful to me and see what kind of awesome goodies you can score by preordering before August 4th. Let That Songbird Go Photography prints, an original Shawnee Kilgore painting made just for you, a personalized mix cd of some real deep cuts (I'll give you my full teenage punk catalog so should you wish!). I am so grateful for your help! Joss Whedon's first directed music video, Back to Eden, out now! 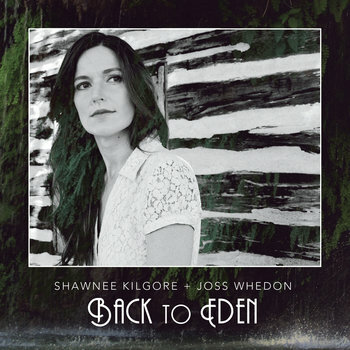 Shawnee Kilgore and Joss Whedon's Back to Eden ~ out now! The long awaited EP is finally here! We celebrated with a bang - and a sold out screening of the Back to Eden music video as well as a full band show that rocked many a faces off!!! Get your digital download of Back to Eden from wherever you like to get your music, and physical copies from CD Baby. Leave a comment on my Facebook music page about your favorite song(s)! The new single is OUT!!! We did it! The response to this song has been tremendous and we're so very proud of it. This incredibly gorgeous artwork is from Jeanie Tomanek of Every Woman Art, and was perfect for us. I've been a fan of her work for some time and had a feeling we'd find what we needed with her. I'm excited to continue mixing the record, which is sounding so amazing, and cannot wait to share it with you. The Kickstarter campaign was a huge success!!! My biggest heartfelt thanks to everyone who has helped this dream record come true. If you missed the deadline but would still like to preorder, click on the Donate button and send $10 for a digital download, $25 for a signed cd, or check out the other exclusive goodies offered via the campaign! This songbird is forever grateful! Thank you! This is the long awaited collaboration EP of Shawnee Kilgore and Hollywood director Joss Whedon, who met via Kickstarter in 2014 when Whedon backed her campaign for A Long and Precious Road and earned himself a personalized song. Big Giant Me was the first single they released that year, and Back to Eden the second in March 2016. The title track also inspired a gorgeous music video, directed by Whedon, including actress Ashley Johnson and Oscar nominated actor Richard Jenkins, released January 23rd.